A whole page of John Byrne drawn Superman, standing strong and re-dedicating himself to his adoptive homeworld = Dan moving house. Some years back a special issue of TIME magazine came out celebrating Superman's 50th Anniversary. 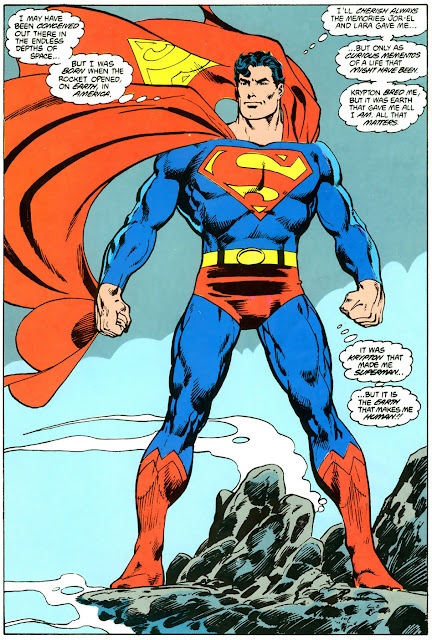 That John Byrne panel in this posting was used among other Superman comic book clip art. That would be a pretty cool edition to have David! This is a cool feature because so often splash pages are as good or even better than covers - I was thinking that reading Fantastic Four from the sixties, that a lot of the covers were okay and then the splash would be incredible! You just hit the nail on the head as to why I set this gig up Aaron! I was in the same boat as you, thinking why should the covers get all the press when the true moments of wow are inside. Personally I think you can get kind of tired of generic shots of a books hero or heroes on the cover. Something taken from the interior, with some relevance is a bit more of a catch IMO.